Sumilon is a fascinating discovery for nature lovers. It was the first marine sanctuary of the country where nature is absolutely in focus. The island is located among crystal clear waters and characterized through its lush vegetation, an untouched sea and a white sand bank. It is definitely one of the best dive spots of the visayas. Sumilon is a 24 hectare large island close to the southeast tip of Cebu. With its large coral settlements, flat channels, hundreds varieties of tropic fishes and other marine attractions it is a paradise for divers. History fans admire the ruins of the historic Spanish watch tower. In front of Sumilon we observe often black-tip sharks and whale sharks. Siquijor is the magic and mystic island of the Philippines. It was part of Negros Oriental and called the “Fire Island” during that time. White sand beaches form most of the 102 kilometer long coastline of the small island Siquijor. It is told that shamans, wizards and witches live on the island. Based on this superstition many Filipinos do not stay on this island over night. This island is a coral reef and declared as a marine sanctuary. Its magic is deep below the blue sea and offers many highlights. Balicasag offers one of the most beautiful snorkeling and dive spots on the visaya islands and is one of our personal favorites. Cabilao is located between Bohol and Cebu. The small island is a perfect place to relax in the nature and enjoy the environment. The main reason for most of the tourists who visit the island are the possibility to dive in between the precious reefs of this island and to see the famous hammerhead sharks. In earlier years those sharks lived in the waters around Cabilao and were seen during special seasons in the morning time. Nowadays the sightings of this fascinating animals are rare. Cabilao, Balicasag, Panglao, Sumilon and the Casseres Reef are reached during our day trips. Trips to Siquijor are offered as two day trips. 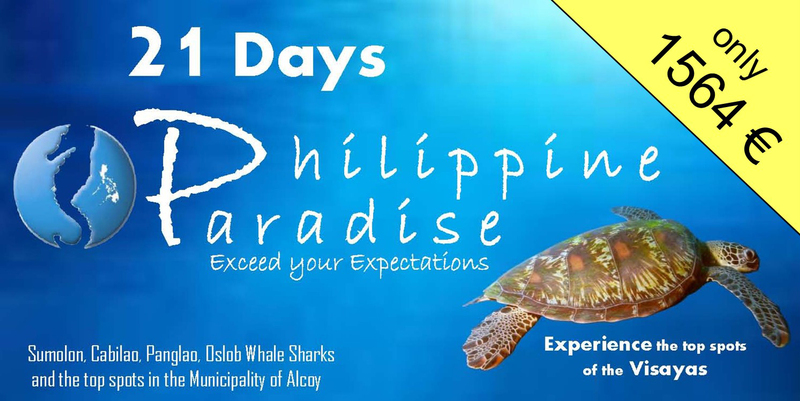 This is just possible including an additional night on Siquijor and according to the number of guests (min. 8 divers) with new requested prices for the overnight stay and the food in the local resort. On our day trips we offer a freshly made barbecue with fish, meat and other side dishes after the second dive. You can buy soft drinks on board. Water, coffee and tea are free of charge. It is possible to make up to three dives during our day trips. The maximum dive time per dive is 60 minutes. We do our house reef dives directly in front of our dive center walking inside the water. The dive spots in the municipal area are reached within a 5 to 10 minutes boat drive. Especially the barrier reef “Mambaje reef” which is located approximately 200m in front of the dive center offers a large variety of corals and fishes of all kinds. If you dive at the house reef without boat and guide you can dive without any time limit. But, consider also the generally approved dive rules. If you book a dive package of 15 boat dives in advance you can do as many house reef dives with you buddy as you want for free. An other dive spot close to the Dive Point is called “Surprise Valley”. As the name promises: everything is possible. Beginning with nudibranches, barracudas, turtles and napoleons up to ghost pipe fishes. During the month February to June we’ve also seen whale sharks in front of our house reef, just 30m away from our Cebu dive center. Be surprised!! During our dives in the municipal area we are not limited to a special dive time. But you should talk with the other guests and our dive crew about your plans to assure that the other guests don’t have to wait to long on our Seaworm (small banka). If you don’t agree on a longer dive time, we plan our dives with a length of 60 minutes.